Stuck at home with a poorly baby, just come back from a weekend away and Ocado is due at 7.30pm, there is NOTHING in the house apart from a few bits of veg and a bag of sweet potatoes… I considered making soup but soup is boring, I don’t feel like I’ve eaten if I have soup!! Managed to find a yellow pepper, 2 small onions and a few chillis and a couple of sprigs of corriander still left in my plant. Salt and pepper wedges popped into my head! I loved every bloody mouthfull of this too! Sometimes a “ready steady cook” moment leads to a recipe for life! Replace the oil for fry light and skip the mayo and you also have a healthy January recipe too! Serves 2 as a lunch or 4 as a side dish. 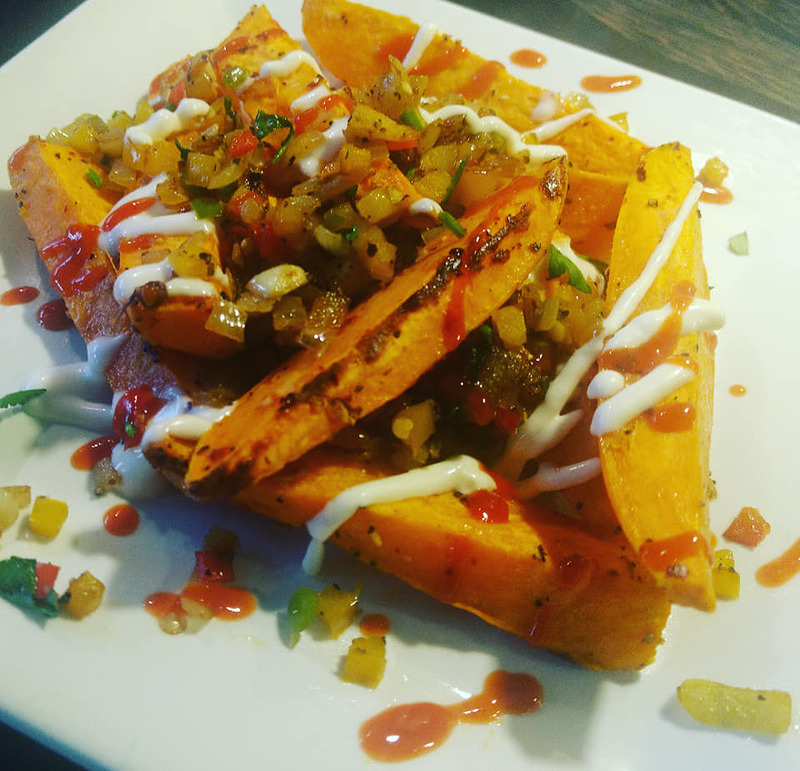 Peel and cut your sweet potatoes into wedges and toss in a bowl with 1 tbsp oil, chilli flakes, ginger and garlic paste and a good grind of sea salt and black pepper. Roast in a hot oven at 200 degrees 180 fan for up to 20 minutes until cooked. Whilst these are cooking heat a tablespoon of oil in a pan and add your diced vegetables with a good grind of sea salt and black pepper and the peppercorns if using and stir on a gentle heat until soft. Next Roasted Cauliflower and Giant Cous Cous.